Yesterday I ran over a list from Esther Derby on how to improve meetings when you’re not in charge. Funnily I had compiled a similar list at our company some time ago divided into participant improvement actions and moderator improvement actions for meetings. The list is thought as a motivation compiled of optional things I can do to improve the meeting. The basic principle behind this is that I am allowed to do this and that with the intention if I’m not doing these things, I should not complain about ineffective meetings. Here is the list. I appreciate any kind of feedback. I see software developers working together to create a discipline of craftsmanship, professionalism, and quality similar to the way that doctors, lawyers, architects, and many other professionals and artisans have done. I see a future where team velocities increase while development costs decrease because of the steadily increasing skill of the teams. I see a future where large software systems are engineered by relatively small teams of craftsmen, and are configured and customized by business people using DSLs tuned to their needs. 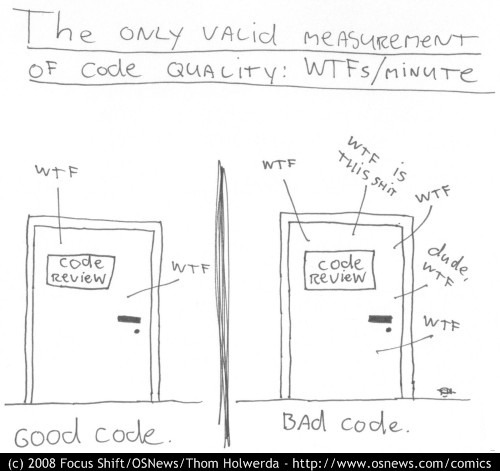 I see a future of Clean Code, Craftsmanship, Professionalism, and an overriding imperative for Code Quality. The related article was named Crap Code Inevitable? Rumblings from ACCU. Today I remember, that I wanted to quote that article by that time to be a mindful reading. After having read over it again, this point is still pending. First, the mentioning of doctors reminds myself of a visit at my doctor in May. I had a problem raising my arm after having exercised too much. After initially stating the problem, my doctor told me to stand up, raise my arm this way, rais my arm that way, raise my arm in another way, and then he had identified the problem. This was amazing when I realized that this way of analyzing a problem in the software is not as efficient. On the one hand it took him no more than 5 minutes to find the cause. On the other hand I realized his level of expertise at this. Clearly I doubt that there was a course back in university held, where my doctor learned this. Basically I consider that he knew how the muscles and fibers are connected with each other. But I clearly doubt that back in his university times there were practial courses where an injured patient with a problem in his arm like myself was asked and evaluated in front of the students. Likewise, even though I did not have a course on test-driven development, but I can take the conscious decision to apply it and communicate my intentions to my colleagues. For this to work I take my personal experiences with TDD and simply do it. Similarly this applies for Acceptance test-driven development. Every day anew I can take the decision to give the best I can in order to delight my colleagues and my customers. Personally I consider this to be an act of professionalism. I detect a certain tendency for craftsmanship to become narcissistic, about the individual’s heroic journey toward mastery. People who think they’re on a hero’s journey tend to disregard the ordinary schmucks around them. Heoric journeys are a problem. Mostly I refer here to an insight from Elisabeth Hendrickson and a work which I think was from Alistair Cockburn, but don’t know for sure anymore. The problem with our education system is that during school you’re the one that fights on your own during the exam courses. In the university it’s your work that gets graded. For PhDs this is even more dramatical (as I have been told, no personal experience with this, though). Then when you get into your first job, you are asked to do team work. But where should you have learned this? The whole value system that worked all of your life gets collapsed. So, what do you do about this? People being “inconsistent creatures of habit” create their walls around them making their work safe against the rants of others. But – and now comes my reply to Brian’s statement above – the Software Craftsmanship Manifesto states differently. Software Craftsmanship is about taking apprentices, teaching what you have learned, what has worked for you, build a community of professionals for valueable exchanges just like the teams from Obtiva and 8thLight has proven to us. This is our responsibility to do. This is professionalism in the sense of Software Craftsmanship and it’s among the things we value.